Perfect for Jewelry, Jewish Spice Box (Havdalah), Paper Clip Desk Box etc. 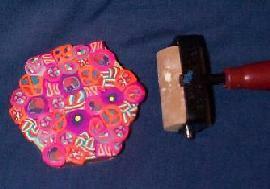 Sculpey or other polymer clay. Tooth Pick, clay pointy tool. 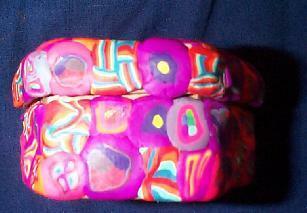 Polymer clay baked on paper mache is a really exciting technique for children and adults. 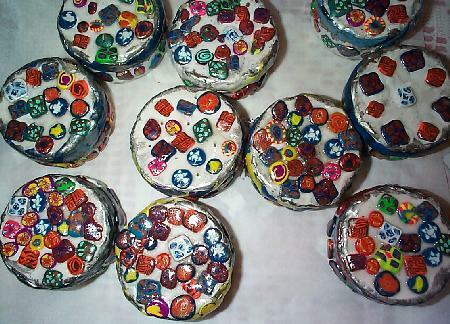 Many commercial paper mache objects can be covered with polymer clay and then baked in the oven. 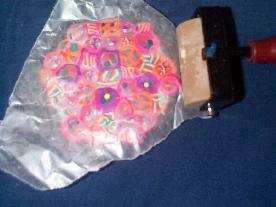 Basic Directions/Tips For Covering Polymer Clay On Commercially Made Paper Mache. Paint with Sobo Craft Glue onto top and bottom of box. Let dry and also cover the insides. This I have been told allows the box to be less porous, adhire to the clay better and protects it. 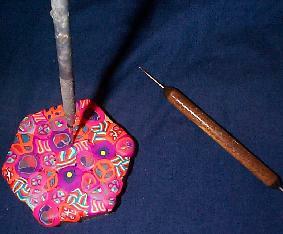 After glue is dried the papermache is ready for your clay. When finished covering, roll gently with brayer on wax paper covered clay to smooth the clay and to allow for even thickness. Trim the clay neatly at edges to allow the cover to fit back on. I like to bake all projects in a pryrex container covered with parchment paper. When making a 2 part project make sure to mark both halves. I like to use permanet markers. 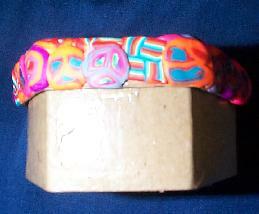 Polymer Clay On Commercially Made Paper Mache 6 sided box. A small six sided box can be used for many things. The pictures below show me punching small holes so to allow smell to come out. This was to make the box into a Jewish spice box used for Saturday night and the end of Shabbath prayers called Havdallah. Smelling the spices are to give you something pleasant to start your week. 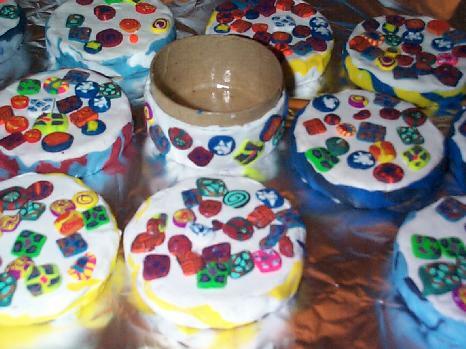 To see more Havdallah Spice Boxes/Jars, See my babyfood jar crafts.and Clay on Glass Page. For all other projects just don't punch in the holes. 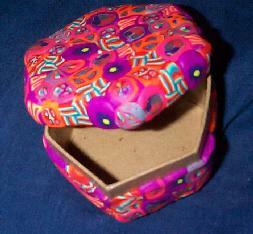 Paper Mache box with Sobo Glue sealer. Same Boxes With Sculpey Gloss Glaze and Silver Metallic Powder Painted on Edge. Same as above but used the white sculpey that comes in bulk to cut the costs. 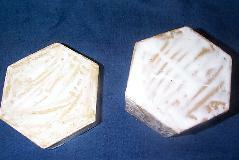 Some have small holes for use as Spice boxes. This project I taught to a class of 3 and 4 year olds. I did a simplified clay on paper mache box. Actually it meant more work for me. I also coated the paper mache with the glue as in above project before bringing it to the kids. The kids also softened the white Sculpey and rolled it out in the pasta machine. (They love the pasta machine! )I did this a little each time at the end of 2 classes. At home I sliced the canes and made an assortment on wax paper for each of the kids. I also at home rolled the white clay onto the sides and top of the cover only. These were short classes so had to do some at home. The kids softened two small pieces of left over clay and rolled snakes. They twisted the snakes together and my helper and I put them on the edge for the side of the cover. After they were pressed in place, I gave out the sheets of cane slices. I gave each kid about 40 slices. I told them if they listened and did everything right I would paint a silver edge on it. They DID ! They were told to put only 10 slices gently onto the top. I demonstrated. Did not want them to sqwish or wreck the slice's patterns. They were then told to put the rest on the side where I had placed the white clay. If they had extra I let them put the rest onto the cover. They did great. I took them home to bake and glazed, adding an edge of silver metallic Fimo powder and Sculpey Gloss. Some of the kids wanted to use these for Spice boxes for a Jewish Custom. 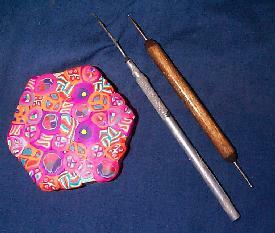 I used a clay tool to push a small hole into the clay and box before I baked it. I also used the tool to clean the hole of gloss so it would be open. One Rabbi's son (4 years old) carried it to Temple the next Shabbat to show everyone! 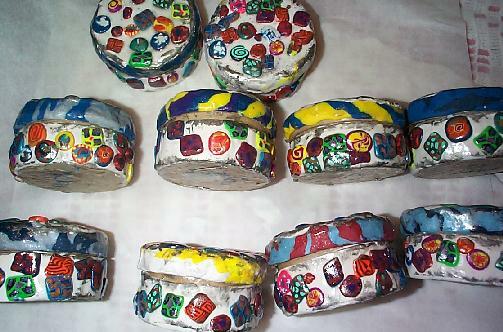 To see more clay on paper mache projects click here.